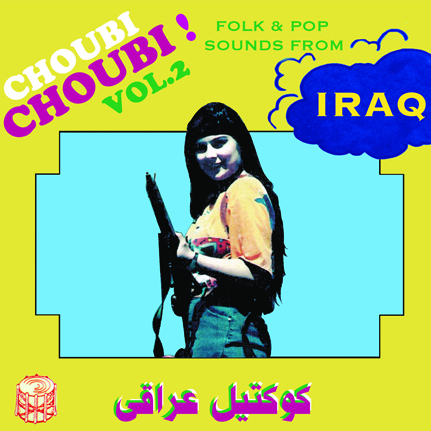 In 2005, Sublime Frequencies released Choubi Choubi: Folk and pop sounds from Iraq, and in the ensuing years it has become one of the most beloved and venerable titles in their catalog. Now, almost nine years later, this highly anticipated second volume is finally here. Compiler and producer Mark Gergis has once again put forth a revelatory and poignant collection of Iraq's national folk music. The musical style most prominently focused on in this volume is the infamous Iraqi choubi, (pronounced choe-bee), with its distinct driving rhythm that can feature fiddles, double-reed instruments, bass, keyboards and oud over its signature beat. Choubi is Iraq’s version of the regionally popular dabke, another celebratory Levantine folkloric style of rhythm and line dance. What really defines the Iraqi choubi sound are the crisp, rapid-fire machine-gun style percussive rhythms set atop the main beat. To the uninitiated, they sound almost electronic. Sometimes they are, but more often this is the work of the khishba – a unique hand-drum of nomadic origin (aka the zanbour – Arabic for wasp), which appears across the board in many styles of Iraqi music today, with extensions of it also heard in Syrian and Kuwaiti music. Among other styles featured in this volume are Iraq’s legendary brand of mawal – an ornamental vocal improvisation that sets the tone of a song, regardless of the style, and the outstanding Iraqi hecha, with its lumbering and determined rhythm pulsing beneath sad, antagonized vocals – as heard on tracks A4 and B2. The tracks on this collection were produced during the Saddam era – between the 1980s and early-2000s. An important goal within the Iraqi Baathist agenda was to promote its brand of secularism, which saw the establishment of cultural centres, and a fostering of the arts. Music was more encouraged, albeit more institutionalized than ever – particularly folkloric and heritage music such as choubi. In an Iraqi army comprised of seven divisions, Saddam referred to singers as the eighth. Still, unless a rare level of stardom has been achieved, being a singer or musician isn’t usually encouraged or viewed as a respectable lifestyle in much of the Arab world. It’s often those deemed social outsiders that tend to find their niche in music – particularly the ‘party music’ heard on this collection. Among them are the Rom Gypsy Iraqis (known as Kawliya in Arabic). A number of female singers wear masks and adopt pseudonyms to protect their identities, as some are runaways or prostitutes making ends meet in the seedy nightclub scene. Occasionally, they end up with successful recording careers. Sajida Obeid, who has appeared on both volumes of Choubi Choubi! is an example of a talented Kawliya singer from the nightclub scene of the 1980s who rose to choubi infamy in Baghdad. Choubi inevitably invokes tawdry connotations within Iraqi society (cheap nightclubs for the lower classes, outcast gypsies and singing prostitutes), but in fact, many calibers of Iraqi singers and ensembles have recorded and performed the music. Unofficially, choubi can be called the national dance of Iraq. Though some may deny this claim (mostly due to its reputation and stigma), at most Iraqi weddings you’ll find people from all walks flaunting their best choubi moves. Iraqi music has always had a way of transcending religious groups and ethnicity, collectively shared between Arabs, Kurds, Assyrians and myriad other Iraqi minorities. In 2013 sadly, this diversity and unity within Iraq is increasingly fragmented, but traditions continue throughout the internationally displaced diaspora. Limited edition 2-LP set in heavy gatefold jacket with beautiful artwork and liner notes by Mark Gergis.